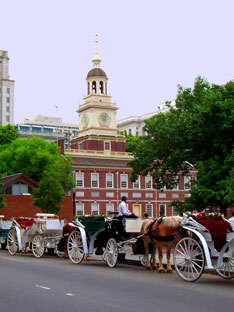 Our 2004 trip to the US ended with a surprise one-day stop in Philadelphia, PA, when we "volunteered" to be bumped from our flight to London. I graduated from a college in Philly, so on this page I've also added some figures to illustrate the increasing cost of university tuition in the US. 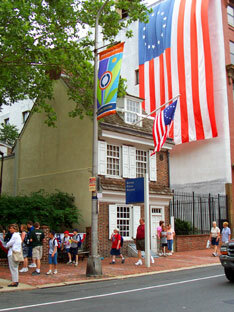 On July 4, 1776, America's Founding Fathers signed the Declaration of Independence in Independence Hall (left). 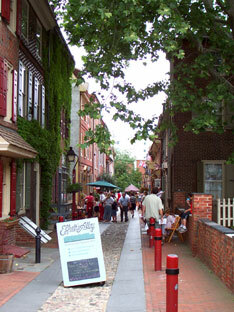 Two other well-known Philadelphia sites from Colonial America are Elfreths Alley (center) and the home of Betsy Ross (right)--tradition says that Betsy helped George Washington sew the first American flag. Some 12.3 million people live in Pennsylvania, and 1.5 million of them live in Philadelphia; the second biggest city is Pittsburg with only 328,000 people (2002 estimates). 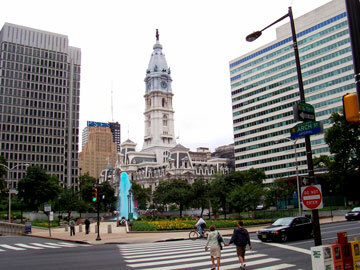 Philly's City Hall (left) has dominated the center of town for ages. 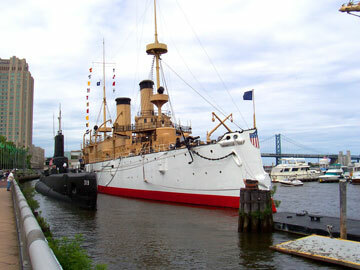 Below you see some of the attractions on the historic waterfront, which include the USS Olympia (an 1800s battleship) and a Tall Ship that is now a trendy restaurant. 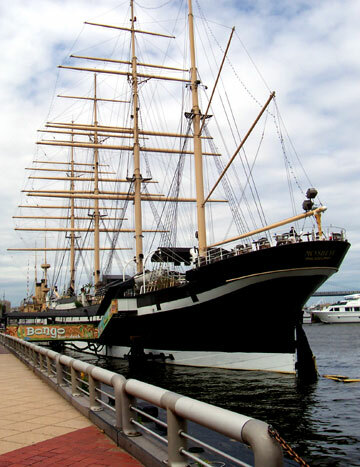 The Benjamin Franklin Bridge starts in Chinatown and takes you to New Jersey. In December 1983, Michael earned an undergrad degree in Sociology at Eastern College (now Eastern University, in St Davids, just outside Philadelphia). Eastern has a beautiful campus--the building on the left has the main dining hall, student lounge, a bookstore, and offices; the old gatehouse is one of the dorms. I drew this sketch of the front gate (in the snow) back in my college days. Now that we are starting to think about Andrew going to college, I was looking at old records and found what Eastern College cost. Tuition & fees for 1981-82 (per semester) were: Tuition $1995, Room $325, Board $525, Fees $150. For the 83-84 year, it had gone up to (per semester): Tuition $2435, Room $400, Board $600, Fees $180. You can double those fees to see a year's costs. From 1978 to 1981, I attended the Ohio State University (Columbus, Ohio). We had three quarters per year (instead of two semesters), and the in-state tuition was $325 per quarter ($975/year; the note I have does not indicate any extra "comprehensive fee"). 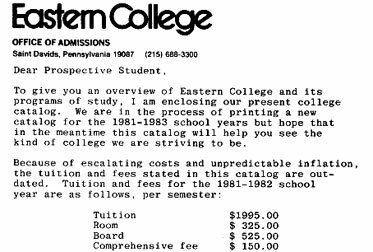 As I recall, the tuition doubled in the next three years, but my parents were being very generous to help fund my switch to Eastern, seeing that the fees went up from $975 in 1978, to about $2000 in 1981, to $4290 at Eastern in 1982. 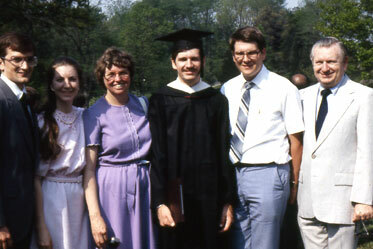 I asked my dad (far right in my graduation photo) what college cost for him. He said that in the fall of 1954, the University of Florida's total tuition fee was $75.00. It increased to $90 the second semester. (To put that in perspective, he said you could get a car for $175.) Obviously, education costs have been growing faster than most of the "costs of living" in the US ever since! The other people in this 1983 photo are (left to right), my brother-in-law Ed Grudier, my sister Kathy, my mom, me, my brother Kevin, and my dad. It's hard to believe that we were ever that young!  According to http://www.eastern.edu/admissions/undg/cost.html, the cost in 2008-09 was (per semester): Tuition $11,335, Room $2345, Board $1960, Fees $95 (first year fees, may not be the same as the "comprehensive fee" in 1981). 2010 figures for Ohio State University are $9420 for tuition, plus $19,584 for room and board. It is interesting that you could buy half a car with the tuition fee in 1954, but in 2010 you can buy a good used car for less than half of the tuition fee! 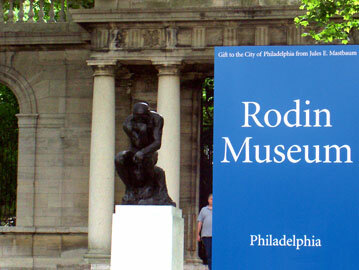 Philadelphia is well known for its many art museums and passion for the performing arts. 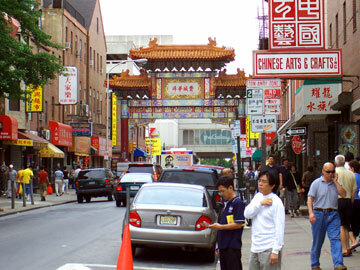 This is Philadelphia's Chinatown. Here, Michael taught his first English classes (to recent immigrants) back in the early 1980s when he was a student at Eastern College.